When the sun goes down, explore Singapore’s most vibrant places with the Night City Tour onboard the fun Open Top Double Decker! The tour start with savouring yummy local eats before diving head on into different exciting activities. There are so many things to do and see – what are you waiting for? Our best selling after-dark 3-hour fully guided sightseeing tours takes you straight to that lively buzz. Hop on now for an in-depth, fun-filled adventure arising from clusters of pubs and clubs, a serene walk through beautiful gardens, hawker-style supper treats and street shopping madness! The trail of good food certainly doesn’t stop when the sun goes down. Tantalise your taste buds with signature culinary delights when you start your tour at Chinatown Food Street (includes $5 food voucher). Now you can taste the goodness of Singapore livin’ by eating your heart out! A visit to this buzzing metropolis isn’t complete without a trip to Gardens by the Bay, a sprawling garden in the city providing mesmerising waterfront views across three gardens. Nighttime brings about its own series of magic – catch the signature Light and Sound show and watch the Supertrees come alive with a dazzling display of colourful hues bursting across the sky! Hang on tight – an evening of retail therapy and fruit-tasting fun is coming your way! 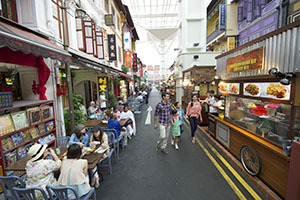 Zip through Bugis Street, Singapore’s most famous undercover street market, complete with shops selling affordable clothing, accessories and beauty services. This trendy hotspot is ideal for folks who love after-dark sprees or a refreshing relish of delicious local tropical fruits. Popular among locals and tourists alike - a drive through Orchard Road, the city's 2.2km retail belt, reveals iconic malls and departmental stores housing everything from quirky labels, high street fashion items as well as international brands. Suntec City plays home to the famous Fountain of Wealth, the largest fountain in the world, which visitors frequent to wish for luck and prosperity. This mall also attracts a great following with fashion favourites, homegrown brands radiating pizzazz and loads of other lifestyle choices. The DUCK & HiPPO Hub is located here! 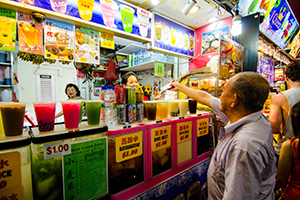 Start the Night City Tours with a taste of local street food at the Chinatown Food Street (comes with $5 food voucher). 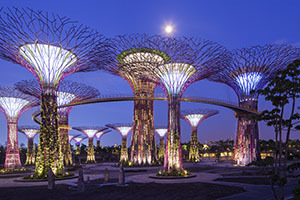 After tucking into satisfying eats representing the most authentic Singapore dining experience, such as Char Kway Teow and Satay, enjoy a serene walk through the beautiful nature park and catch the spectacular Light & Sound Show at Gardens by the Bay. Next up, expect a wild time at Bugis Street, Singapore’s largest night street market. Sample a handful of delicious tropical fruits and put your bargaining skills to great use while you shop to your heart’s content. 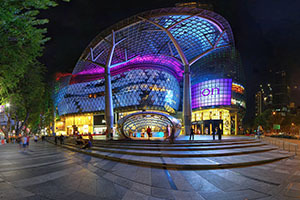 An after-dark adventure would not be complete without a breezy drive through Orchard Road, Singapore’s quintessential retail and entertainment haven. Finally, end the night at Suntec City, the second-largest mall in the island city. Chinatown Food Street is a yummy blast from the past, the perfect offering for foodies who would like to relish iconic treats beloved among locals in the classic al-fresco setting. With the $5 food voucher, you get to feast on a selection of dishes that underscore Singapore's rich multi-cultural heritage. Gardens by the Bay by night is a visual treat like no other. Watch the Garden Rhapsody show while you're there - a feel-good performance where the Supertrees come alive in a dazzling display of light and music. The Bugis area boats an interesting history, being renowned internationally from the 1950s to 80s for its nightly gathering of trans women. Today, Bugis Street is the largest street shopping location in Singapore, enthralling fashionistas with its daily updated offering of clothes, shoes and accessories. It is also where visitors can sample delicious, thirst-quenching tropical fruits on the go. It may be hard to imagine that just over 150 years ago, the famous Orchard Road – true to its name – was a small lane lined with orchards, plantations and farms. This tour brings you on a drive through Singapore's prime shopping belt, which, today, is proudly flanked by iconic fashion outlets, hotels, restaurants and other entertainment haunts such as art galleries. Suntec City is widely recognised as one of Singapore's most exciting retail destinations, enthralling shoppers with a curated mix of retail stores comprising everything from high street fashion to electronics to lifestyle brands. It is also where the magnificent Fountain of Wealth – intricately designed such that the water flows inwards (representing riches pouring in) – is located. 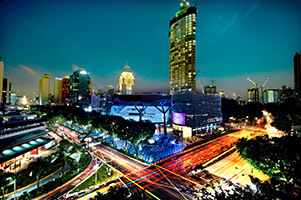 Our intricately planned itinerary aims to set an unforgettable tone for your after-dark exploration, where participants will be taken to the city's leading points of interests and experience what's most famous about each attraction, be it food, street shopping or soaking in the bustling atmosphere of Orchard Road on board a Open Top Double Decker Bus. Many have raved about the street-shopping and fruit-tasting opportunity, so if you're looking to be privy to the secrets of Singapore's sundown, this exciting 3-hour tour is the choice for you! 1. Wear comfortable shoes as there is a fair amount of walking to do. 2. Dress casually – you'll want to be comfortable while you're looking for cheap steals and munching on fruit. 3. Bring a camera and work out the camera settings – plenty of picturesque moments await.